Over in the United States @StrongTowns asked is it possible and/or worthwhile to retrofit suburbia or should we just abandon underused suburban places. They also asked what to do with Big Box stores (large format retail in the Proposed Auckland Unitary Plan) in retrofitting them out for future use. Strong Town will run a series over at their site http://www.strongtowns.org/ site this week. I submitted an entry based on the Auckland experience with those two questions asked above although it did not make it through final selections with good solid competition. None-the-less I will publish the short essay below for your reading. Retrofitting Suburbia; is it worth it and how do we go about reformatting large format retail? Those very questions my home city of Auckland have been coming to grapple with as we face an acute housing shortage on the back of booming population growth and land values fetching a decent premium. Auckland Council through its Auckland Plan and Proposed Auckland Unitary Plan has an objective that between 60-70% of the 400,000 new homes to be built by 2042 must be in existing urban areas with the rest (up to 160,000) in Greenfield areas north and south of the city. So where to put up to 280,000 new homes inside the existing urban area? Amalgamating sites to take benefit of the upcoming new rules (the Unitary Plan) around density restrictions being waivered takes time and resources before the resource consents are filed and the sod turned to build a new set of residential dwellings. Attention thus turns to the vacant land (often owned by Auckland Council or the State (Crown held land)) or underutilised land (so Big Box Retail sites) where lot sizes are large and little perquisite work like demolishing existing structures is required. Cue two suburban areas in South Auckland known as Manukau and Manukau City Centre that has large tracts of both blank land and underutilised land in the heart of the South Auckland urban area (For clarification Manukau consists of the residential areas to the south of Manukau City Centre which was the commercial heart of South Auckland (Auckland as a region had its main City Centre further north)). The idea behind Manukau and Manukau City Centre was to decentralise Auckland in the 1960’s and 1970’s so that Auckland would have multiple centres connected by the then fledgling motorway system. The result as of 2016 would be a car centric minor city centre that has a lot of blank and underutilised land, a large mall and plenty of big format retail connected with bus and motorways connections and as of 2014 a rail connection to the Southern Line that runs trains to Britomart in the Auckland City Centre. The dream of establishing a second City Centre with supporting residential areas around it never came to fruition for Manukau until now. It could have been easy for Auckland Council and the New Zealand Government to abandon the under-used spaces in the Manukau area and focus more towards to main City Centre further north or Greenfield expansion further south. But after years of lobbying by the South Auckland community and its elected representatives in April 2016 the Auckland Council’s Auckland Development Committee chaired by Deputy Mayor Penny Hulse gave the green light to the largest urban renewal project (not related to a natural disaster like the 2011 Christchurch Earthquakes) in New Zealand. Led by Auckland Council’s urban development arm Panuku Development Auckland, Panuku would be the stewards in overseeing 600ha of urban renewal across differing but underused urban topologies. 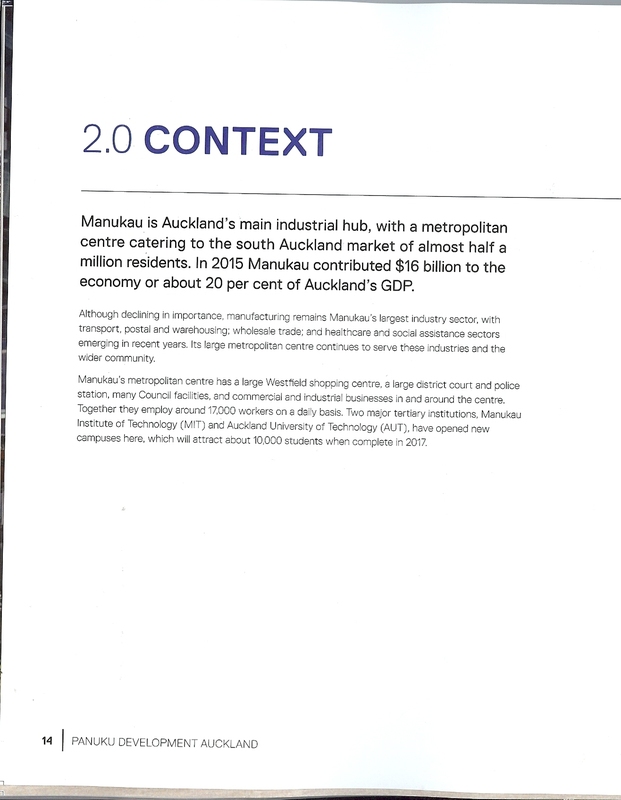 The project would earn the nickname Transform Manukau and had eight goals to achieve in order to strengthen Manukau’s 20% or $70 billion contribution to the Auckland region’s economy. The Transform Manukau area includes private, Council, and Crown owned land with residential, commercial, industrial, civic, recreational, and natural land uses. The cost to Auckland Council and its Ratepayers will not be cheap either with $70m budgeted just to kick start Transform Manukau. This is also before any central Government contributions such as new or refreshed state housing on Crown owned land, or new infrastructure such as highway or rail extensions. But the potential benefits to Manukau, Manukau City Centre, wider South Auckland and the entire Auckland region cannot ignored. Remember when I said up to 280,000 new homes had to be built in the existing urban area? Well already since Transform Manukau went live 3,000 new homes across a range of topologies (detached, duplexes, terraced housing, walk up apartments and mid-rise apartment blocks) are in various stages of planning and hopefully due to start construction next summer. Housing for older-persons is also in the mix in the southern area of Transform Manukau as well. Once the Proposed Auckland Unitary Plan goes live in September certainty can be reached on what land owners can do with their land inside the Transform Manukau area. This brings me to the second part of how do we go about retrofitting large format retail. Large format retail is predominate in Manukau City Centre and while it does have its uses its land use footprint is inefficient especially in a high density area like Manukau City Centre. So how do we go about retrofitting short of total demolition of the site? Either one of those two options are favourable as it means better utilisation of scarce land. Thus the (proposed) rules and economic incentives (land values and public investment by Panuku) in Manukau have one land owner wanting to build residential apartments above their large format retail. For them they see economic benefit of mixed used rather than single use on their sites. For Auckland it is a win with further housing to come on stream, potentially more commercial space thus better land utilisation in the existing Manukau City Centre area. Another way to go about retrofitting is offer tax incentives to the land owner to undertake retrofitting of the big box store. I am not in favour of public money being used this way especially if the rules and market place would allow retrofitting in the first place. So ask yourself? Are your City zoning rules the biggest hindrance in allowing big box retail to format in an urban area needing or wanting to undergo urban renewal like Transform Manukau? If your rules are prohibitive rather than permissive then everything else you try is moot. In concluding remarks: Is it possible to retrofit suburbia and underused spaces? Manukau would say yes it is possible. How do we go about retrofitting big box retail? Rules- go for the rules first and economics (including economics of public-led urban renewal) will do the rest. So in the Manukau case it is both possible and worthwhile to retrofit out the suburban space both in the suburban Manukau area and Manukau City Centre itself. As for big box retail the owners of the Manukau Supa Centre site want the zone flipped from General Business Zone to Metropolitan Centre Zone in the Proposed Auckland Unitary Plan? Because the land owners DO want to reformat their big box retail to allow apartments above their retail stores at the ground level. Given the housing situation and the Centres-Plus policy of the Unitary Plan, allowing the Manukau Supa Centre owners to retrofit their large format retail to allow apartments above their retail stores would be extremely prudent. It is whether they convinced Judge Kirkpatrick and the Unitary Plan Hearings Panel to allow the area to be rezoned to Metropolitan Centre to allow the apartments to be built (Council objected).